This sweepstakes ("Promotion") is only open to residents in the 50 United States, the District of Columbia, and Canada. 1. How to Enter: To enter, visit hub.associaonline.com/sweepstakes to fill out and submit the Entry Form. Entrants must enter all items in the Entry Form. Number of Entries per Person: Each entrant will get one (1) entry per person/household upon submitting the Entry Form. Thereafter, each entrant may learn of additional ways he or she may qualify for additional entries. No automated entry devices and/or programs permitted. All entries become the sole and exclusive property of the Sponsor, and receipt of entries will not be acknowledged or returned. Sponsor is not responsible for lost, late, illegible, stolen, incomplete, invalid, unintelligible, misdirected, technically corrupted or garbled entries, which will be disqualified, or for problems of any kind whether mechanical, human or electronic. Only fully completed Entry Forms are eligible. Proof of submission will not be deemed to be proof of receipt by Sponsor. 2. 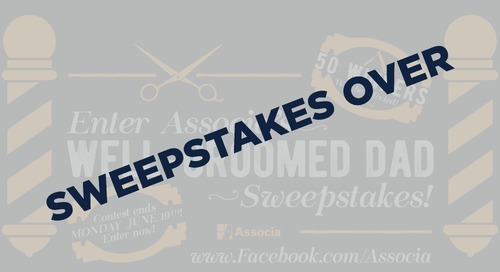 Eligibility: Participation open only to legal residents of the fifty United States, the District of Columbia, and Canada who are 18 years or older as of Promotion Start Date and who “like” Associa on its Facebook page. Void outside of the 50 United States, the District of Columbia, and Canada, and where prohibited, taxed or restricted by law. Officers and directors of Associations, Inc. dba Associa ("Sponsor"), and Associa’s respective parent companies, subsidiaries, affiliates, and their respective, officers, directors, partners, advertising and promotion agencies, manufacturers or distributors of Promotion materials, the respective immediate families (parents, children, siblings, spouse) or members of the same household (whether related or not) of any of the foregoing are also not eligible to enter. All federal, state and local laws and regulations apply. 3. Promotion Start/End Dates: Promotion begins 12:01 AM ET on July 5, 2017 (“Promotion Start Date”) and ends at 11:59 PM ET on July 12, 2017 (“Promotion End Date”). 5. Prizes: A total of five (5) prizes is available. 6. Notification: Potential winner(s) selected will be notified by email on or about 10 business days after the Promotion End Date and may be required to sign and return, where legal, an Affidavit or Declaration of Eligibility and Liability/Publicity Release ("Winner Eligibility Documents") within 7 days of prize notification. If a potential winner is considered a minor in his/her jurisdiction of residence, the Winner Eligibility Documents must be signed by potential winner's parent or legal guardian, and such prize will be delivered to minor's parent/legal guardian and awarded in the name of parent/legal guardian. If any potential winner cannot be contacted within 5 days of first prize notification attempt, if any prize or prize notification is returned as undeliverable, or if any winner rejects his/her prize or in the event of noncompliance with these Official Rules, such prize will be forfeited, and an alternate potential winner will be selected from all remaining eligible entries. Upon prize forfeiture, no compensation will be given. Limit one prize per person/ household. Sponsor reserves the right, at its sole discretion, to disqualify any individual it finds, in its sole discretion, to be tampering with the entry process or the operation of the Promotion or website. Sponsor may prohibit an entrant from participating in the Promotion or winning a prize if, in its sole discretion, it determines that said entrant is attempting to undermine the legitimate operation of the Promotion by cheating, hacking, deception, or other unfair playing practices (including the use of automated quick entry programs) or intending to annoy, abuse, threaten or harass any other entrants or Sponsor representatives.